Fourteen years after the release of The Bourne Identity, the Bourne movies have deviated so drastically from Robert Ludlum’s source novels that, like James Bond, the film character exists separately from his written inspiration. Over the course of three ’00s movies (The Bourne Identity, The Bourne Supremacy, The Bourne Ultimatum), Matt Damon became Jason Bourne. In 2007, when he decided it was time to go, the filmmakers were left with a Sean Connery-sized dilemma and, as was the case with Connery, the eventual solution involved luring back the original actor. Damon’s return to the title role, the fifth film in the franchise, represents a coup for Universal Pictures. After Jeremy Renner failed to capture the public’s interest in The Bourne Legacy, the series’ future looked uncertain until Damon and co-writer/director Paul Greengrass agreed to terms. Despite regurgitating elements from the founding trilogy, Jason Bourne represents the best the series has yet offered. Jason Bourne doesn’t deviate substantially from the established Bourne movie format. 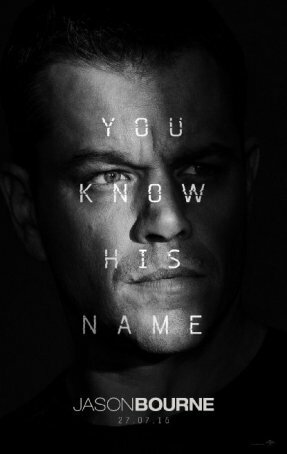 It’s Bourne (Matt Damon) against the CIA in a “get them before they get you” struggle. For this outing, the only one to return from the original Bourne trilogy (other than Jason) is Julia Stiles’ Nicky Parsons, an ex-agent who now works for a Wikileaks-type organization. The CIA is populated by newcomers - director Robert Dewey (Tommy Lee Jones), cyber expert Heather Lee (Alicia Vikander), and a nameless shadowy assassin referred to only as “The Asset” (Vincent Cassel). The movie crisscrosses the globe, stopping in locations like Reykjavik, Athens, Berlin, London, and Vegas. Jason Bourne is characterized by a relentless intensity that exceeds that of even The Bourne Ultimatum (the best of the first four films). Greengrass’ camerawork is part of the reason. His penchant for hand-held shots is highly effective in some of the movie’s chaotic scenes (such as a riot in Athens) but it has been tempered for the more static sequences. Damon’s interpretation of Bourne (as a killing machine whose pain is deeply buried but occasionally visible) works well within the context of the story and, like Arnold Schwarzenegger’s Terminator, he has very little dialogue. Damon does most of his acting with his eyes and jaw. The throbbing but not overpowering musical score (credited to John Powell and David Buckley) enhances the tension. When it comes to keeping audiences uncertain and white-knuckled, the movie rarely lets up. Prepare to be exhausted at the end of the two hour running time. With Joan Allen, Brian Cox, and Albert Finney long gone, it’s time for some new blood at the CIA. Tommy Lee Jones gives a strong, Fugitive-esque representation of the company man/patriot whose Nixonian approach to National Security makes him less-than-likable. Alicia Vikander plays her inexperienced but intelligent role with minimal emotion; her performance is closer to Ex Machina than her Oscar-winning turn in The Danish Girl. Vincent Cassel is on board to provide the kind of psychotic character he has become known for. Although the screenplay gives “The Asset” an ambiguous backstory, few viewers will find even a scintilla of goodwill for the man. Although Jason Bourne is part of an ongoing franchise and works best for those who have seen at least the first three chapters (the movie has little or no connection to The Bourne Legacy), it’s like most other multi-sequel action series (James Bond, Mission: Impossible) in that it can stand on its own. Bourne is the protagonist but not necessarily a hero. The CIA agents vary from being outright bad guys to people somewhere in the middle. Jason Bourne continues the theme of identity that was so important in the original trilogy but here it’s interleaved with the basic instincts of survival and revenge. If the latter is a dish best served cold, then Bourne is the perfect waiter. The film’s ending allows for future installments of the “prime” storyline should Damon and Greengrass decide to return (at least insofar as the Bourne movies are concerned, they’re a package deal). The open-endedness, however, doesn’t leave the viewer unsatisfied. The key plot elements are all wrapped up and the loose ends are merely hooks that can be used to reel in another sequel. Jason Bourne is more than a just worthy addition to a popular franchise - it’s the cherry on the top. It proves that when a creative team puts forth the time and effort, financially motivated motion pictures can still be gratifying. Jason Bourne is two hours of exhilarating, unrelenting cinema.